On this page all those poems have been accumulated, which didn't fit into any other category of poems and songs. You might poems about dreams, mortality, beasts and plants, famous or notorious persons, about thoughts, love and melancholy here. Pick your favourite topic! Here we have something for the local newspaper I guess, which would go in the lonely hearts section. Yet it's a little different compared to the regular advertisement. For one it rhymes. Second, it has a bit more imagination - and honesty probably too - than the traditional stuff. Plus it's a bit weird, but quite original. So: Will our writer find her counterpart? Uhm… er… hello out there! I guess you must know me. Though to be honest, I'm not sure. above all I seem to lack, well, allure? not that much fun to be around. that's to what it all boils down. Now I don't deny that, it's true! No point in pretending otherwise. So, if you hoped for that, I'm sorry. they gather I'm nothing but a shell. I'm a traveler of worlds? I may be sassy, savvy, sly. I even solve some murder cases! aye, and occasionally I've… died! and next day I'm a luminous knight. and stumble upon a dragon's lair. A king, an alchemist, a vengeful witch? A princess? A hermit punished with an itch? A dwarf, an elf, an outcast reviled? that they drag the rest of the person with them along? Rather you're – dare I hope? – of another kind? one who's got a heart, because he's got mind? One who can't be made from a common mould? I've got a thing for words. Could it be, you're a related soul? so how about we take a stroll? away from the milling crowds. and it takes courage to take a leap! Who says you don't have gills and fins! chances are we could be twins! with that I'm truly blessed. from wafer-thin paper I do feast. my means, my magic, are verse and prose. saving our species, for it's dying out! A bookworm in search of a mate. In wake of the hellish Dragonstorm, in which a massive flight of dragons wrought destruction on the northern part of Sarvonia, the peoples who bore witness to the carnage were swept up in mourning for their loss. Amongst those who wrote of the disaster was a one Varthin Aldris, then a young man, who was so stirred by what he saw it sparked a lifetime interest in poetry and the written word. This is the first piece he is known to have written. From heights above comes fury, ire, revenge. An dragon attack on an Erpheronian fortress. In wake of the flight. The following is a song about the Nerthers that is performed at inns and taverns across the length and breadth of Santharia. The name of the city is changed based on the area of Santharia in which it is sung. This version of the song originated in the city Marcogg and patrons take part in the chorus, well the least inebriated ones do in any case. 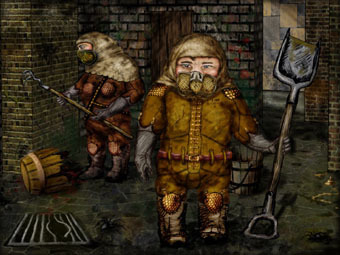 For the benefit of those unacustomed with dwarf culture, the Nerthers are a society of dwarves involved in the collection, processing and sorting of waste products, both in their own native dwarven settlements and the human cities of Santharia. Seth Ghibta and Bard Judith. ”The Dance on the High Bridge” is a song popular among the street urchins and poorer folk of the Manthrian capital Marcogg. It refers to the famous High Bridge, the uppermost of the many bridges that cross the Mashdai River as it cascades down the rocky slopes on which Marcogg is built. 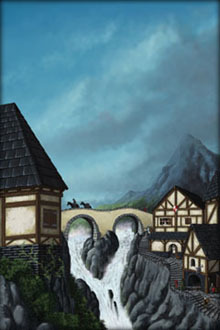 As it connects the Great Temple of Nehtor with the Thane’s Palace, the bridge is used daily by a wide variety of people from all trades and classes. The song probably started its life as a lighthearted ditty, to be sung while crossing the bridge. Wanderers of a fearful disposition could avail themselves of the song to help them forget, while setting foot on the narrow stone construction, how far they would fall if the bridge crashed, how wild were the waters beneath, and how sharp the rocks. The last four verses, however, likely represent late additions to the song. They are thought to refer to Skeijorn Herrhal Marmarsek, also known as Skeijorn Purse-pincher, an unpopular mayor of the 13th century, who was infamous for the harsh punishments he dealt subjects who were unable to pay their taxes. And keep your feet dry? take the High Bridge and dance. his back bent from his load. leaps and hops to the other side. with their carts full of stuff. Bow and dance a duet. Comes the fuzzle to seek. on the bridge she must dance. leaves his seat and prances near. gets his legs in a twist. as he drifts down the stream. gather round, brave and bold. to their mayor, the knave. Take the High Bridge and dance! This may be a poem; it may be a receipt; or it may be an incantation. Most likely, it is all of these things. 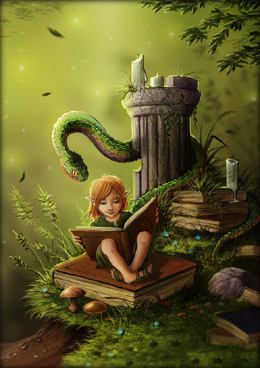 The verses were written on a parchment that had been left stuck between the pages of a book in the library of Lorehold. An unsuspecting researcher happened to open the book at the right page, and out sailed the parchment, like a letter from a faerie, or from someone long since dead. We warn the reader that the compendium’s editors have changed some of the ingredients mentioned in the verses, therewith preventing the wicked and the misguided from concocting “Etherus’ Delight”. And three big spoons of nightshade seed. To make your loved one want you. Boil it for three days and nights! From the top the slime you scoop! In your lush and wanton soup! Don’t let it cool – but make him swallow. First lure his tongue – his soul will follow. His obstinate heart into my gentle fist! He’ll kneel and he’ll squeal and he’ll beg for my kiss! This at first fairly innocent-sounding lullaby concerns the Manthrian superstition of the “Evil Ear” – that certain people can steal pieces of others’ souls by listening to them, and return said “soul crumbs” tainted, so that they inflict any number of ill-effects on the victim. When read with the knowledge of the persecution those suspected of having the evil ear faced, including being intentionally deafened and disfigured, the lullaby takes on a distinctly sinister air, which perhaps explains why it is seldom heard outside of Manthria, where the superstition is endemic. They’ll hear from you no more. Came this way once before. And they’ll hear from you no more. Your soul to her is winging. Your words are secret things. With silence like a crown. And gives them back upside-down. And clutches her head so tight. She came this way before. This song by Judith of Bardavos puts us into the shoes of a fierce warrior who isn't afraid of heroically approaching a deadly foe - the Aglan Slug! Image description. The mighty Agalan Slug... Picture drawn by Seeker. Oh, I dared too much, and by reckless such, are heroes thrown away. With its name a sigh like a battle cry, I stepped into its way. It's far from home, my ghost doth roam - you'll see me walking now. So to reeking ooze my life did lose, and haunt this fen the while. Handwritten by the poet: Sordoc 'The Great' presents an extract of Sordoc's poem "Ode to the Oxen" as a teaser prior to Sordoc's upcoming reading of this seminal work. Sordoc would like to point out that Sordoc spent a year following these most majestic of all animals as they walked back and forth across the Peninsula of Iol. As such, Sordoc is a much greater authority on the Paxen than the likes of Deklitch Hardin. Sordoc would also like to remind you that copies of 'Romancing the Beast' are available for purchase, and that Sordoc is starting a new round of public lectures on Sordoc's travels. Image description. The object of affection... Picture by Jonael Tomeskrift. In the year 9th century a.S. Ravenport again survived a siege. The current leader of Ravenport who would be murdered within a month by the losing party of the siege, wrote down the following lines in his journal, ment for his son. Your character’s not delicate, nor radiant nor genteel. And though the wind may grow dead calm, it will come back for thee. Yet he’s not broken, bent perhaps, his eyes with fire aglow. Alive and proud, my Ravenport, fair city for my heir. Amongst the oldest literary relics of the Ancient Tiquaitan men, this poem was written on the death bed of the revered Foreseer Anadaliaus, a highly accomplished man who devoted his life to curing the political climate of his time, something he succeeded in. Anadaliaus managed to unite the Feudal Cities of Tsu, Jirai and Chima into one, cooperative state- known as the 'Union of the Tiqua' or 'Tiquaitan'. The poem expresses Anadaliaus' optimism in the face of his own death in the strength of the union he orchestrated, a trust which seemed to be misplaced after his death with the 'Red Sunset' - the single bloodiest conflict in Tiquaitan history so shocking that it warranted almost complete obedience for thousands of years. Image description. Descending into gold... Picture drawn by Ingeborg. This piece (found crumpled behind a stack of dusty books on vicious beasties) pretty much covers the aspects of the researchers that spend their time helping to expand the Compendium. You have those that roam the world in an attempt to pry the secrets of plants and beasts. Those that look toward magics old and new and discuss theories that few can understand. More look toward the shaded past than anyone could count, attempting to bring the good and bad forward for all to see. Everywhere one looks there are those that are attempting to bring life to the living through words, art, or music. So we celebrate our history hinderers for each of us is one in one way or another. This poem was originally a piece of prose written many centuries ago by an eccentric whale watcher trying to describe the reason for his passion for whales. It was then rediscovered by a poet who was inspired while he was looking through old books, parchment and scrolls which he had found deep in the cellar of the Library of Ciosa. The nearly dissolved parchment instantly got his attention, and he eventually wrote a poem about the Carteloreen based on the writing of this whale watcher. Tap‘ring tails to help them jump. Make the watchers all applaud. Allies of the Merfolk too! Riders of the northern pass. Leave behind the shells and sand. Her all the rooms with heavy sigh. Beneath an oak with branches bare. And Liz fell for a man of trade. That seems to linger in this place. As night was melting into day. We stood atop the hill a while. Kind Queprur gently took my hand. The poem below was written at the time of the Dragonstorm of 1650 b.S. by a young poet who is thought to have died during the disaster, he was unknown by name. It was found among the ruins of Voldar a short while after the Dragonstorm had subsided, the parchment was torn and the writing faded, not every word could be properly recovered and a couple of verses were lost but what could be saved was kept safely in respect of the many lives that were lost. When the Dragonstorm does burn. Raining down from the peaks. Yet possessing an elven grace. Have no emotion, and fight with un-ending aggression. Breeds the end of humanity. Sweet love, the darkness comes in gentle grace. With cold, her moonlight shows thy misty breath. As silent as the steps of calming death. Lo! Winter rises whilst the spring decays! All crops are harvested and food is gone. Thy bony form grows paler with the days. I’d kill to spare thine eyes, they skin, the dawn. Each hour, each passing moment; more than life! I’ll love thee whether thou art near or far. Do not be frightened of this blessed knife. To mortal things just whisper last goodbyes. A final kiss, my love, then close thine eyes. Will love you, Sorrow, till the day I die. dealing with mastering the difficulties of life. And for these times I dearly paid. “We are on our own as we climb ahead. Still others would not – they wanted to stop. He said one day “Climb on without me. And with those friends I’d cast my lot. And, if I betrayed her, whose heart I stung. And lessons of life to these children I’d tell. Despite some heartache and strife. And left me to toil up alone, bitter and slow. His time was over and his years were spent. And have remembered him fondly all my years. When we were a’wandering on perilous ways. Which took us through forest and fragrant heather. And the Mountain is cold, it is covered in snow. I am nearing the Top: this much I know. For Life is but a journey that Death cannot taint. I dwell within my ruined world of stone. Against those shadows creeping round my heart. Of me. But then the vision fades to gloom. I break like shattered mirrors of the past. Who swallow up the day and darkling light. Each house, each creature that could dare oppose. Whilst wild and orcish hordes destroy foes. Be born again, more wicked in thy heart. And dim the moon, and kill each star away. To comfort thee? To heal thy tarnish heart? And take revenge for all their brutal lies. A place inside still filled with naught but gloom. Remind thee - brief’s the pathway to thy tomb. With nothing left to save thee from thy rage. Of elves, with love that made each broken heart turn whole. Alas, the darkest prophecy would end up thine. The hellish monster desecrating purest elven womb! To leave his evil seed to feed, on thy to feast! A horrid dining leading thee into thy tomb! It shall be She who will return thee to thy place. Soft embers glow beneath the hearth. Would softly lull his mind to sleep. Then take his naps in willow bend. His bones were weak. Those times were past. Such troubles plagued his heart and mind. A thought to leave it all behind. Who whispered “Welcome” with their eyes. This particular poem was found crumbled up in the hand of a man that had frozen to death. The poem itself was written with coal on a piece of old parchment. The people that found the man were unable to identify him and he was buried where he lay, as the villagers were afraid to offend Isaya if they'd moved him. I see white tracks in snow. my eyes have no view. I see Isaya smile to me. there is no track to follow at all. Surrounded by snow I wait for Her. She searches for my warm life. I see white flakes of snow. there is no way to go. I see Her scythe shining brightly. sure She will take me away. as She searches for my warm life. Out into the dreamer’s land. While embers glow on a sky-hearth. Of grass begins to softly fade. Stretching across the sandy beach. Upon the lazy ocean tide. And house mice sleep in bars and taverns. While in tufts of grass hide dragonflies. Dozes until the rising morn. Wanders off to sweet repose. Ascend into the dreamer’s land. The scarlet flaming feathers flowing. Crimson and amber begin to fly. Corruption and evil crumble to ash. Arises justice and all that’s right. To where this fire bird hath flown. And may hear secrets before unheard. As though to burn away the sin. Stand in wait for the phoenix to rise. 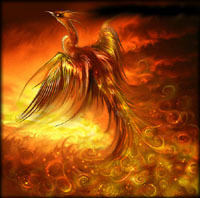 The phoenix: a winged mystery. the shine of the stars. That our sun would never fade away. and now you say you won't stay. and then your love withered to dust. I thought we would never end. for you loved me no more. and I am all left alone. and now you have faded away. And I can't help it. To students, I'm a god. To my peers, I'm a sage. To history, I'll be a titan. The ancient way-song my blood sings. My students would be distraught. My peers would be confused. My legacy would be confirmed. I curse the eyes of history. I forswear the things of this world. I swear my defiance to the moon. I'll pick up my old stick. I'll drop my new staff. I'll doff these fine robes. I'll put on coarse cloth. Yes, I know, my friends. We'll be on our way soon. A shadow's creeping out of sight. It stalks in strong and silent might. Into prey's flesh its canines tear. My love beyond immortal trial. Poison in a dark crystal vial. This vessel will soon break. But what is this strange shimmering band? trampling the heart and mind. from what awaits us all. from a bag already half-empty.